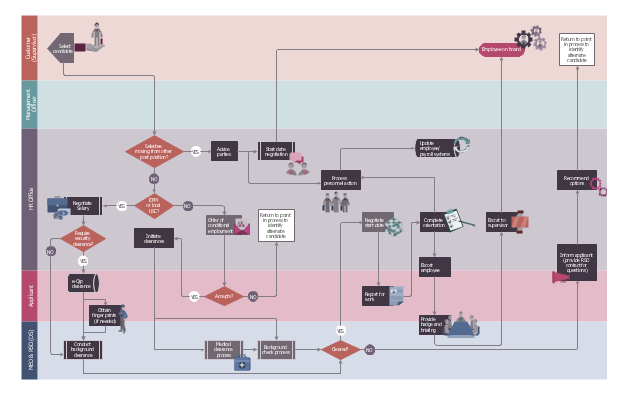 HR infographics "Recruitment model" was desined on the base of the picture in the article "Better, Faster: streamlining recruitment in the APS" from the Australian Public Service Commission website. "Managers are critical to the success of all recruitment exercises — but they are not recruitment experts, nor should they be expected to be. Their success will be greatly enhanced if they have the active support of recruitment experts from HR. To create an organisational culture where the expectation is that recruitment processes will always be timely and effective, it is necessary to develop a shared understanding of roles and responsibilities. The model shows three clear lines of responsibility. 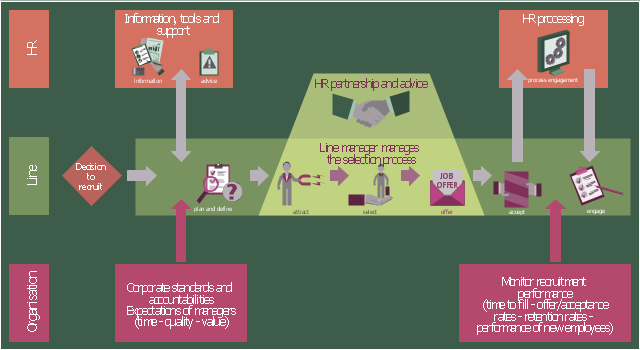 HR provides the structure and support; managers plan for, manage and undertake the process; and recruitment quality and performance standards are set and monitored at the organisational level." 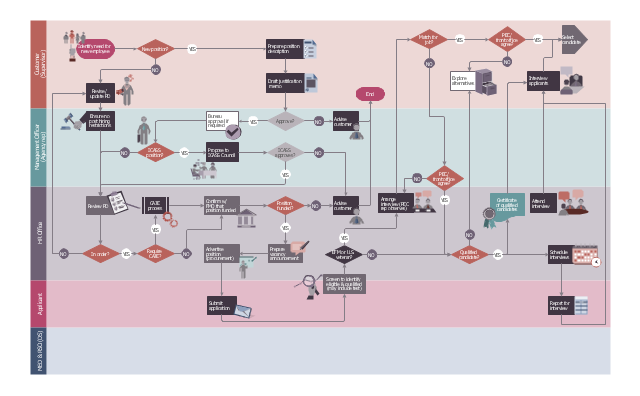 This HR flowchart example was redesigned from the Wikimedia Commons files: File:(5) 2008-07-07 Recruitment pg1.jpg (1st page), File:(5) 2008-07-07 Recruitment pg2.jpg (2nd page). "ROLE OF THE POST EMPLOYMENT COMMITTEE (PEC).